(L-R) King County Flood Control District Executive Director Michelle Clark; River and Floodplain Management Senior Engineer Chase Barton; and Water and Land Resources Director Josh Baldi stand on the bank of the Tolt River and discuss channel migration. On a gray day last month, a small group of King County and King County Flood Control District (Flood District) employees stood on the forested edge of the Tolt River upstream of Carnation. Geologically speaking, this is a young river – sinuous, fast-moving and largely unconstrained as it courses from its headwaters in the Cascades to its confluence with the wide, slow-moving Snoqualmie River. Chase Barton, an engineer with the King County’s River and Floodplain Management (Rivers) Section in the Water and Land Resources Division (WLRD), looked out across the swirling water. 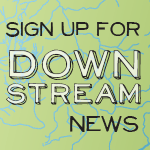 “This portion is the most rapidly migrating river of those we manage in King County,” he said. Teresa Lewis, River and Floodplain Management Project Manager, discusses the Tolt River’s historical channel migration. The field trip was an opportunity to show Michelle Clark, the Flood District’s executive director, and April Sanders, policy director for Flood District Supervisor Kathy Lambert, proposed changes based on public input to the draft Tolt River Capital Investment Strategy in advance of a meeting with the Flood Control District’s Executive Committee. The tour – which also included WLRD Director Josh Baldi; Program and Policy Services Supervisor Brian Murray, Project Manager Teresa Lewis, and Communications Manager Leslie Brown, from the Rivers Section – provided a window into the work undertaken on behalf of the Flood District. Michelle, who became the Flood District’s executive director in December, asked several questions of the team, wanting to understand both the rationale and the cost implications behind various actions. The Tolt is a short but powerful river, flowing some 30 river miles and dropping about 3,000 feet from its headwaters in the Cascade Mountains to the valley floor. Its upper reaches, through steeply forested incisions, are largely inaccessible. The lower six miles wend through a rural, woodsy part of north-central King County, an area with narrow roads and widely spaced homes. Nearly continuous levees border the last two miles of the river, protecting more densely developed residential areas as the Tolt enters Carnation and flows into the Snoqualmie River. Flooding has long been an issue along these lower six miles of the Tolt; many residences are at risk during even modest flood events. But also of concern is what is called channel migration, when the river changes course and cuts a new path, heedless, of course, of private property lines. Rivers staff recently completed a 98-page study of the Tolt’s channel migration patterns along its last six miles, a carefully researched analysis that looks at the river’s history, geology, the characteristics of channel migration and those areas where hazards are greatest. Channel migration can happen slowly as a river moves across its floodplain. It can also occur in the blink of an eye, when, for instance, a geologic or weather event causes a river to suddenly change directions. The Tolt, as the study points out, “exhibits moderate to high lateral channel migration rates.” Avulsions – the sudden movement of a channel – “are a major component” of these migration hazards. As a result of the Tolt’s dynamic nature, the county and the Flood District over the past decade have purchased several at-risk properties. Since 2007, when the Flood District was formed, 35 at-risk homes have been purchased along the Tolt, all from willing sellers. Forty percent of the funding for those purchases came from sources other than the Flood District. The draft Capital Investment Strategy identifies another 30 properties at risk of flooding and channel migration. County officials plan to hold a public meeting in Carnation on May 8 to discuss its channel migration analysis with neighbors, community leaders and others interested in the river’s hazards. (L-R) King County Flood Control District Executive Director Michelle Clark, River and Floodplain Management Senior Engineer Chase Barton, and Program and Policy Services Supervisor Brian Murray head back to the office after several hours on the banks of the Tolt River. Back on the Tolt, Teresa noted the important role levees or revetments can play in public safety but added that such tools aren’t effective on rivers as active and energetic as the Tolt.